Years ago, I went to a garage sale and loaded a cardboard box with old kitchen gadgets, pots, pans and even an old oil tin from the basement of the sale. When I arrived home, I noticed that the muffin tin uncharacteristically had 8 sections. 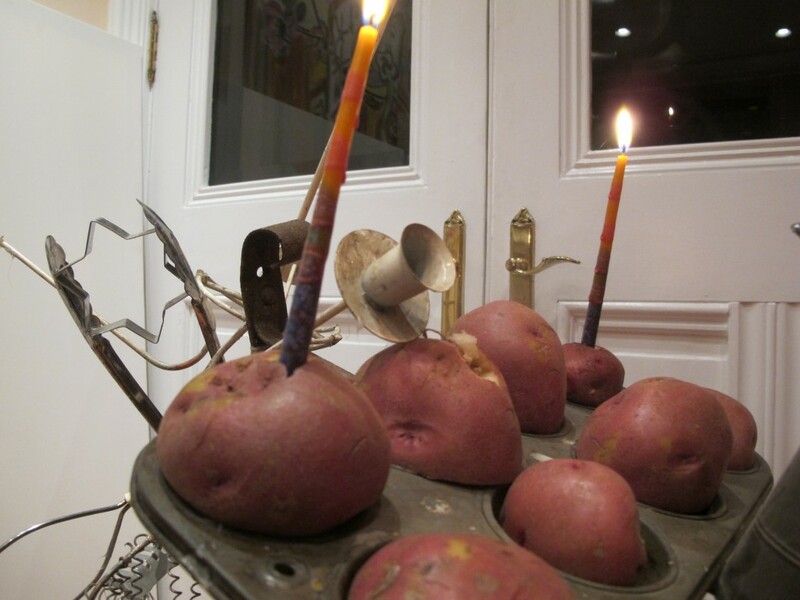 It would make the perfect holder for 8 potatoes for the latke mobile menorah that I decided to create. 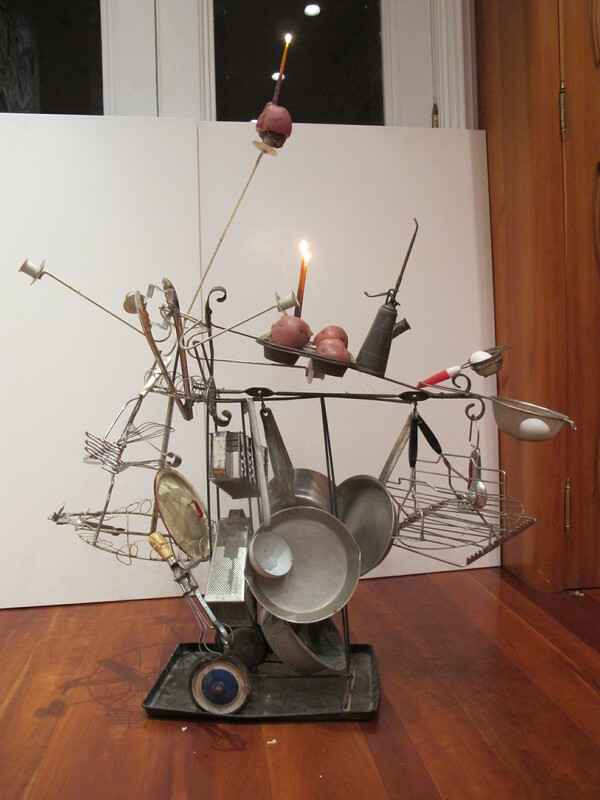 I used an old croquet trolley to mount the muffin tin, pots, pans, whisks, strainers, and twisted an old candelabra to make an arm held high to hold the shamas. Looking through the utensils, I found a Star of David cookie cutter which I incorporated as well, and interpreted as meaning “yes, all this unrelated junk was meant to be a menorah”. Even though my menorah is dedicated to the latke, the symbolic fried food that I make for chanukah comes from my Hungarian roots: langos. As a shortcut, go to the supermarket and buy uncooked pizza dough. Let it rise once at room temperature, then form into disks about 6 inches round and a third of an inch high. Heat about one inch of cooking oil, such as canola oil, in a frying pan until hot. Place the disks of dough in the frying pan and cook both sides until brown and puffy. In Hungary, it is served as a savory delight so sprinkle with coarse salt and pepper, some people like to rub it with garlic. As a Canadian treat, omit salt and pepper and serve it with maple syrup for the Chanukah celebrants to dunk. This entry was posted in art, decor, food, recipes, thought and tagged Chanukah, chanukah recipe, cooking, food, HANNUKAH RECIPE, hungarian chanukah recipe, langos, latke, maple syrup, menorah, recipes, star of david, star of david cookie cutter. Bookmark the permalink. 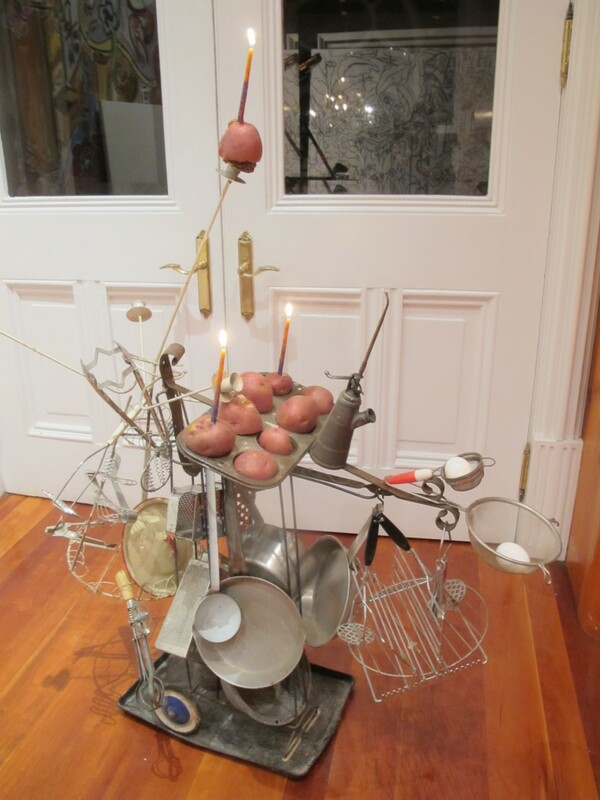 Your Menorah idea is simply genius, unpredictable, so outside the box it made me laugh. I simply love your originality. I bookmarked your site.